Our Products >> Man's white sapphire ring inlaid with onyx and Australian opal. 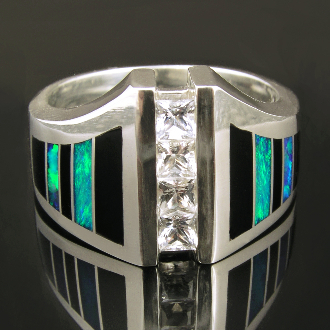 Striking sterling silver man's white sapphire ring inlaid with black onyx and Australian opal. Four sparkling princess cut white sapphires totaling .88 carats are channel set across the top of the ring. Three pieces of black onyx and two pieces of bright blue-green Australian opal are inlaid down each side. It is hand signed "MMH" by jewelry artisan Mark Hileman on the inside of the ring. This handmade ring measures 15mm wide and is shown in a size 10 1/2 for scale. The sample ring shown in the photo has sold. A matching ring will be made to order in your specific ring size in 4 to 6 weeks. Please call if you have a rush date and we will try to accomodate. Opal has been mined worldwide, however, Australia accounts for 96% of all commercial opal and is the main source of precious opal. Australian Opal is mined in many locations throughout New South Wales, Queensland and South Australia. Because of the unique conditions under which opal is formed, it is nearly impossible to find two opals exactly the same. Opal is the only gemstone known to man to have the natural ability to diffract light. An opal's color is created when the voids between the particles split light entering the stone. The size and alignment of the spheres and voids, as well as the light source, determines the colors produced. To view an opal's color play at its best, the light source must be coming over your shoulder. An opal's color can cover the full spectrum of the rainbow.